Earth flies between Mars and sun on May 22, bringing it closer than Mars has been in over a decade. 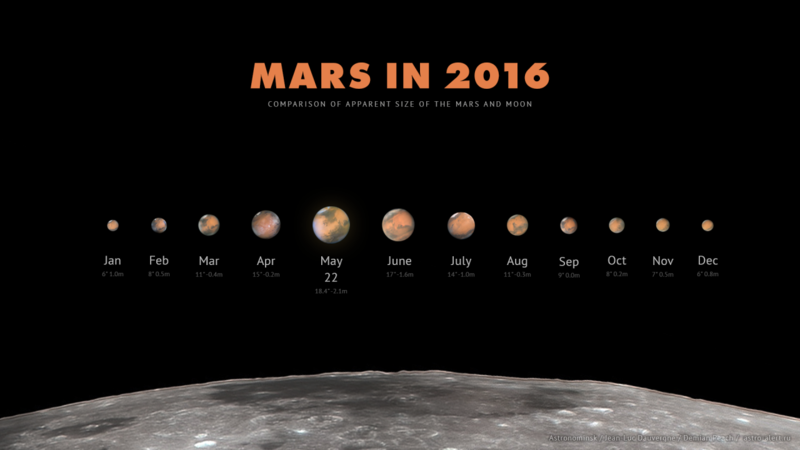 How to find and enjoy Mars during 2016’s close opposition! Bright one here is Mars, with Saturn and the star Antares also very noticeable in a triangle pattern on the sky’s dome. Watch for them! Photo taken on the morning of May 8, 2016 by Simon Waldram. Thanks, Simon! Why are Mars’ oppositions so variable? View larger | Mikhail Chubarets in the Ukraine made this chart. It shows the view of Mars through a telescope in 2016. We pass between Mars and the sun on May 22. We won’t see Mars as a disk like this with the eye alone. But, between the start of 2016 and May, the dot of light that is Mars will grow dramatically brighter and redder in our night sky. Watch for it! What is an opposition? All superior planets – that is, planets orbiting the sun outside Earth’s orbit – are said to be at opposition whenever the Earth passes in between that planet and the sun, in our smaller and faster orbit. The superior planets that are easily visible to the unaided eye include Mars, Jupiter and Saturn. Uranus and Neptune are also superior planets. Mars is the next planet outward from Earth, at a mean distance from the sun of just over 1.5 astronomical units (AU). One AU equals one Earth-sun distance. For comparison, the superior planets Jupiter and Saturn reside at a distance of about 5.2 AU and 9.6 AU. 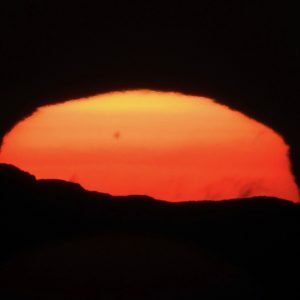 Earth passes between the sun and Mars in a mean period of two years and 49 days, though the time period between successive oppositions is actually quite variable. An opposition can come anywhere from two years and one month – up to two years and two and one-half months – after the prior one. At all oppositions of Mars (or any superior planet), the planet shines at its brightest in our sky and rises when the sun sets. It’s opposite the sun, as we swing between it and the sun. Mars at opposition stays out all night long, from sundown to sunup. It climbs highest up for the night at midnight. Diagram by Roy L. Bishop. Copyright Royal Astronomical Society of Canada. Used with permission. Visit the RASC estore to purchase the Observers Handbook, a necessary tool for all skywatchers. Read more about this image. Why are Mars’ oppositions so variable? 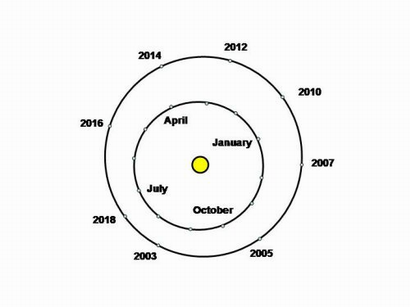 Earth’s orbit around the sun is very nearly circular. But Mars has a much more eccentric (oblong) orbit, which brings the red planet some 43 million kilometers (26 million miles) farther from the sun at its farthest point (aphelion) than at its closest point (perihelion). That’s why the distance of Mars at opposition varies so widely. Earth flies between Mars and the sun every two years; sometimes that happens when Mars is far from the sun in its orbit, and sometimes it happens when Mars is close. 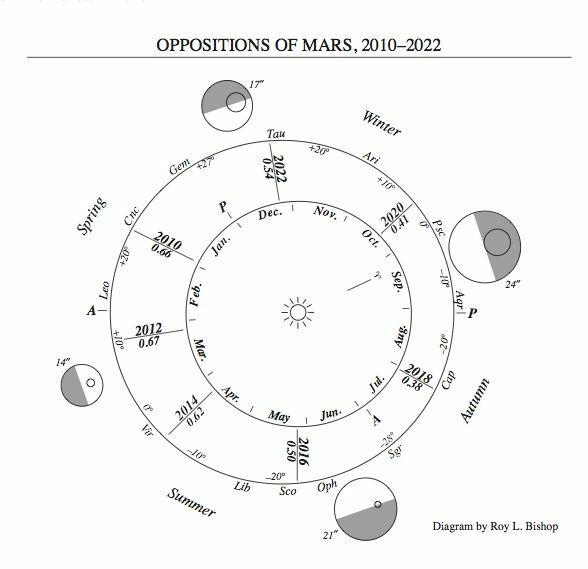 The cycle of close and far Mars oppositions is about 15 years long. More about that below, or examine the chart above. You might see that a Mars opposition coinciding with perihelion (the planet’s closest point to the sun) will be much more magnificent than a Mars’ opposition at aphelion (farthest point from the sun). Astronomers call a Mars opposition coinciding with Mars’ closest point to the sun a perihelic opposition. For example, the angular size of Mars’ disk during a perihelic opposition is nearly twice as large, and the brightness of Mars is nearly five times as great, than at an aphelic opposition. 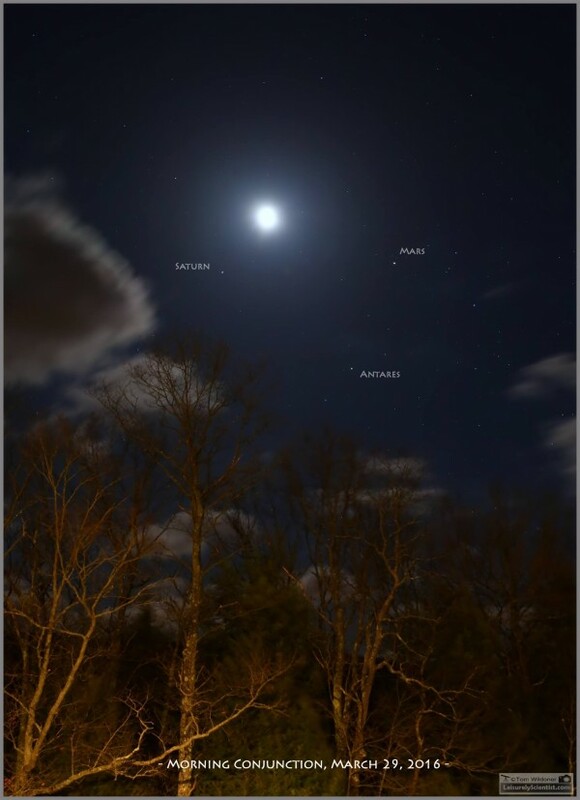 Mars, Saturn, star Antares and moon on March 29, 2016 from Tom Wildoner in Weatherly, Pennsylvania. The two planets and bright star make a recognizable triangle on our sky’s dome throughout the opposition months. Or let the moon guide you to Mars. Look for the Blue Moon to pair up with Mars on the sky’s dome on May 21. The green line depicts the ecliptic – sun’s path across our sky. 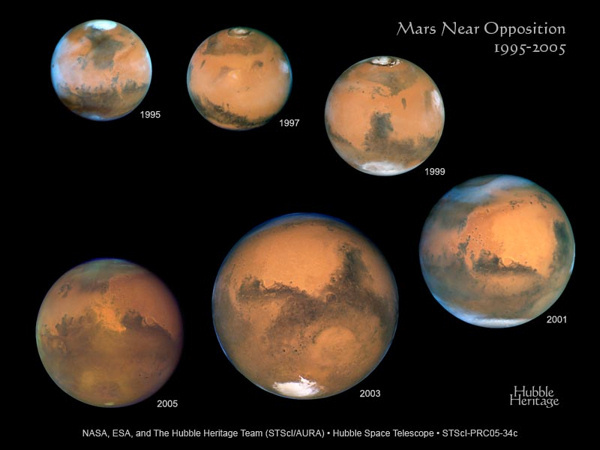 How to see Mars near its 2016 opposition. 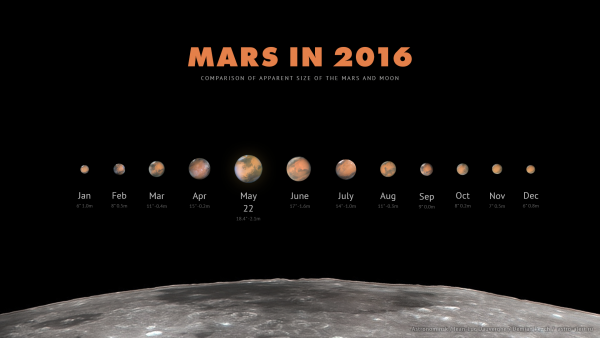 This year, we’re doubly lucky, when it comes to Mars. The planet is having a close opposition. And it’s visible on our sky’s dome within a noticeable pattern – a triangle – with Mars, Saturn and the bright star Antares marking the corners. 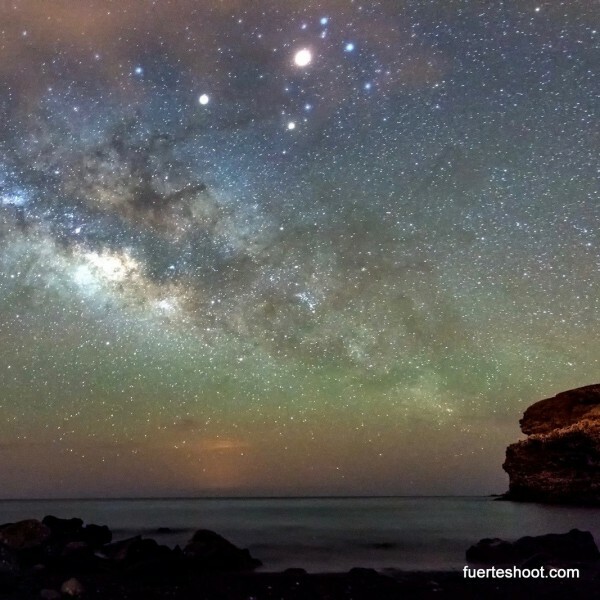 Mars shines near the planet Saturn and Antares, the brightest star in the constellation Scorpius the Scorpion, not just at opposition, but for many months in 2016. You’ll enjoy picking this triangle out on the sky’s dome now, and comparing the brightness of Mars to that of Saturn and Antares in the coming months. On its opposition date on May 22, Mars shines some 7 times more brilliantly than Saturn, and some 17 times more brilliantly than the red star Antares. Incidentally, the name Antares means like Mars. The ancients probably gave it that name because of the similarity of color between this star and the red planet. Notice the two objects’ colors. And notice how much the star twinkles while the planet Mars shines steadily. If you’ve never been able notice the steady light of planets, Mars and Antares can help! 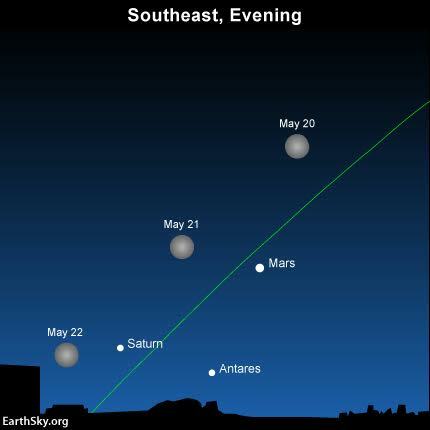 Be sure to let the moon guide you to Mars, Saturn and Antares for several nights, centered on May 21. See the chart above. After opposition, Mars will start to decrease in brightness, fading to Saturn’s magnitude by November, 2016, and then to Antares’ magnitude in January, 2017. But you can see that Northern Hemisphere summer (Southern Hemisphere winter) in 2016 will be an awesome time to amaze your family and friends by pointing Mars out in the night sky. In 2016, Mars will briefly match the brightness of Jupiter, currently the brightest starlike object in the evening sky (since Venus is now behind the sun). By the way, Mars has a much greater swing in brightness than do the planets Jupiter and Saturn. On rare occasions, Mars can (briefly) outshine Jupiter in the night sky during a favorable opposition. Meanwhile, in a non-opposition year, the red planet remains rather inconspicuous, blending in with nighttime’s numerous modestly-bright stars. For instance, one year after the May 22, 2016 opposition, Mars will be some 5 times farther from Earth and some 30 times fainter. In the year 2017, Mars will fade into a faint ember of its once-fiery self at opposition. The little triangle of objects just above the horizon is Mars, Saturn and Antares. 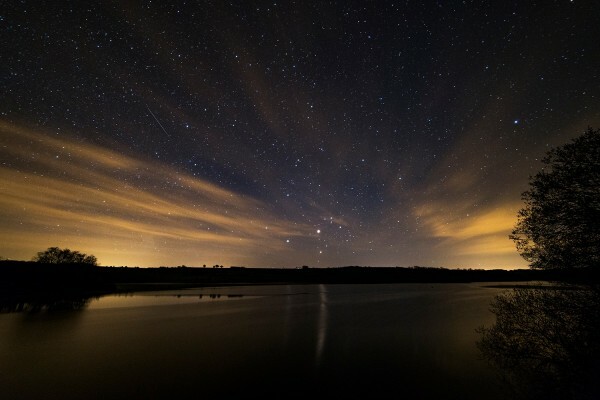 Notice bright Mars is casting a long reflection in the lake, which is Lake Wimbleball in Somerset, UK. Photo posted to EarthSky Facebook by Paul Howell on May 1, 2016. The inner dark circle represents Earth’s orbit around the sun; the outer dark circle represents Mars’ orbit. When Mars is near the sun, as it was in 2003 and will be again in 2018, we have an extra-close opposition. On the other hand, 2012 was a particularly distant opposition of Mars because Mars was far from the sun in its orbit. Diagram via Sydney Observatory. The greatest/closest opposition of Mars since Stone Age times happened on August 28, 2003 (55.76 million kilometers or 34.65 miles). Close oppositions repeat in cycles of 15 to 17 years, so the oppositions of 2018 and 2020 will feature respectably close encounters – though neither will match the record-breaking opposition of August, 2003. Similarly great Martian oppositions recur in cycles of 79 and 284 years. 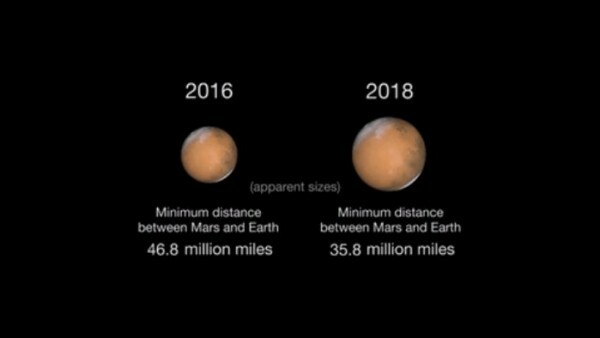 Seventy-nine years after the 2003 opposition, the opposition on September 1, 2082, will present Mars only a hair’s-breadth more distant than it was during the super-close opposition of August 28, 2003. Then 284 years after the 2003 opposition, a new record for closeness will accompany the August 29, 2287 opposition (55.69 million kilometers or 34.60 million miles). Then 363 years (284 years + 79 years = 363 years) after the record-setting August 29, 2287 opposition, the opposition of September 4, 2650, will break that milestone to set another new record (55.65 million kilometers or 34.58 million miles). Distant Mars oppositions recur in cycles, too. Surprised? Of course, you aren’t. Cycles abound in outer space. A particularly small or distant opposition of Mars will happen on February 19, 2027 (101.42 million kilometers or 63.02 million miles). Distant oppositions recur in periods of 15 to 17 years, so the years 2042 and 2044 will feature small oppositions, as well. Neither Mars opposition will be as distant as the 2027 one, however. Similarly distant oppositions recur in periods of 79 and 284 years. But we don’t find a more distant opposition than the one occurring in the year 2027 until 442 years later (284 years + 79 years + 79 years = 442 years), on February 27, 2469. At that time, the red planet will be a whopping 101.46 million kilometers (63.04 million miles) from Earth. Telescopic image of Mars. During a close opposition, like the one in 2016, observers will make out more features on the planets surface. We won’t see Mars this size again until 2018, when Mars will put on an even better show. Illustration via nasa.tumblr.com. Bottom line: This year, in 2016, enjoy the favorable opposition of May 22, as the red planet Mars shines in close vicinity of the planet Saturn and the red star Antares.